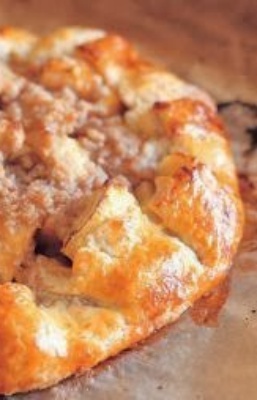 One of my favorite ways to get thru the bushels is The Barefoot Contessa's Apple Crostata. It's easier to make than an apple pie and I prefer a higher apple to crust ratio (hey, I'm trying to use up a lotta apples!). For the pastry, place the flour, sugar, and salt in the bowl of a food processor fitted with a steel blade. Pulse a few times to combine. Add the butter and pulse 12 to 15 times, or until the butter is the size of peas. With the motor running, add the ice water all at once through the feed tube. Keep hitting the pulse button to combine, but stop the machine just before the dough becomes a solid mass. Turn the dough onto a well-floured board and form into a disk. Wrap with plastic and refrigerate one for at least an hour. Flour a rolling pin and roll the pastry into an 11-inch circle on a lightly floured surface. Transfer it to a baking sheet.